Videos should be coming shortly…like tonight. UPDATE: Or maybe tomorrow. Got everything updated (XP, Vista with Service Packs and video editing software, new version, and other patches, and a new monitor) and now we’re done with last week’s program. I am hoping to get these done and uploaded by Sunday night, Monday at the latest, so far I haven’t made it. My plan right now calls for 10 weeks of this stuff, which takes us right through the election. Feel free to offer feedback. Welcome to the REALLY United States of America!! How Do I Turn Off Tony Kornheiser? McCain: No Science For You!!! Dmitry Medvedev, Russia’s president, has said Georgia’s attack in August on the pro-Russian breakaway region of South Ossetia was his country’s equivalent of the September 11 attacks on the United States in 2001. The president made the comments at the annual meeting of the Valdai Club, a group of political analysts and Russia experts, in Moscow on Friday. Medvedev also said that he would have sent in Russian troops regardless of how closely tied Georgia was to Nato and that he would do so again if needed. Al Jazeera English – Europe – Russia: S Ossetia ‘was our 9/11’. Why is this calling Palin out? In her first interview granted to her adoring public she mentioned this situation to dislay her vast grasp of the nuances of international negotiations. GIBSON: Let me ask you about some specific national security situations. GIBSON: Let’s start, because we are near Russia, let’s start with Russia and Georgia. 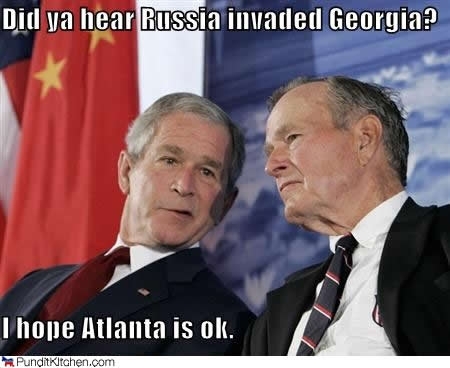 The administration has said we’ve got to maintain the territorial integrity of Georgia. Do you believe the United States should try to restore Georgian sovereignty over South Ossetia and Abkhazia? PALIN: I do believe unprovoked and we have got to keep our eyes on Russia, under the leadership there. I think it was unfortunate. That manifestation that we saw with that invasion of Georgia shows us some steps backwards that Russia has recently taken away from the race toward a more democratic nation with democratic ideals.That’s why we have to keep an eye on Russia. O.k. In the interests of reality, I’m going to have to link a few stories here. This is the backstory for this and it’s important to comprehend to appreciate the complete…jaw-dropping ignorance Palin displayed in the interview. Georgian military commanders confirmed an invasion began in the early hours of Friday morning, raising fears of a serious diplomatic crisis between the country’s western allies and Moscow. The United States swiftly called for calm, but appeared to apportion more blame on Moscow and the separatist forces it supports for taking the volatile region to the brink of war. Just hours after Mikheil Saaskashvili, Georgia’s pro-western president, declared a unilateral ceasefire, his armed forces began an artillery barrage against Tskhinvali, the rebel capital. But there is strong support for independence in the regions, including South Ossetia. And the decision to recognize them as independent came much more quickly than the South Ossetians expected. After the Russian parliament’s decision, South Ossetians drove through the streets, waving Russian and Ossetian flags and spraying champagne to celebrate. Their goals — independence, then marriage with Russia — suddenly seemed within reach. So.. to summarize, an attack that Sarah Palin didn’t think happened is being treated by Russia as a terrorist attack similar to 9/11. The civilians who were attacked by Georgia don’t want to be a part of it (hence “rebels”), and would rather join their brethren in North Ossetia, which is a part of Russia proper. Many considered themselves to be rescued, rather than invaded. Part of the issue here is that there is a distinct racial difference between Georgians and Ossetians. And their history is different. So, to some up…Russia is basically ready to go to war after their 9/11. Sarah Palin doesn’t even think it happened. She’s in complete denial, or in complete ignorance. AND THAT’S EVEN WHILE SHE, LITERALLY, KEEPS AN EYE ON RUSSIA. PALIN: And, Charlie, you’re in Alaska. We have that very narrow maritime border between the United States, and the 49th state, Alaska, and Russia. They are our next door neighbors.We need to have a good relationship with them. They’re very, very important to us and they are our next door neighbor. GIBSON: What insight into Russian actions, particularly in the last couple of weeks, does the proximity of the state give you? PALIN: They’re our next door neighbors and you can actually see Russia from land here in Alaska, from an island in Alaska. GIBSON: What insight does that give you into what they’re doing in Georgia? I guess she didn’t literally “see” Georgia shelling civilians, so it didn’t happen. This is unfortunate, as you can’t see 99.99999% of Russia from Alaska. I don’t think we are going to keep good relations with Russia if our Vice-President denies their “9/11” ever happened. How will that work? GIBSON: Under the NATO treaty, wouldn’t we then have to go to war if Russia went into Georgia? PALIN: Perhaps so. That is the agreement. When you are a NATO ally, is, if another country is attacked, you are going to be expected to be called upon and help. …and then you think about who is educating Palin on these issues…(hint: he’s currently being paid by Georgia for “security consulting” and is a card-carrying Neocon). Randall J Scheunemann is an American lobbyist. He is the President of the Committee for the Liberation of Iraq, which was created by the Project for the New American Century (PNAC), of which he is a board member. He was Trent Lott‘s National Security Aide and was an advisor to Defense Secretary Donald Rumsfeld on Iraq. He is a paid lobbyist for the country of Georgia and is 2008 Presidential candidate John McCain‘s foreign-policy aide. He lives in Fairfax Station, Virginia. 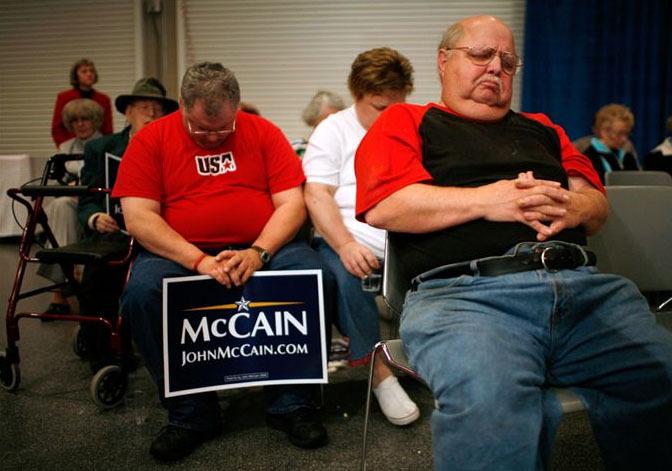 This is who is teaching Palin about the world. No wonder she missed an entire side of the argument and is ready to start a war at the drop of hat. NOTE: Because of the general fucked-upedness of the Georgian situation and my general unfamiliarity with the region, I don’t think this situation is as black and white as it has been presented in the U.S. media. Just reading through these few articles probably made your head spin a bit (it did mine), but to assert so strongly that an event the PRESIDENT OF RUSSIA called their 9/11 didn’t happen…this isn’t someone I want anywhere near a negotiating table. TSKHINVALI, Georgia (AP) — Officials in South Ossetia said Friday that Russia intends eventually to absorb the breakaway Georgian province. Russian President Dmitry Medvedev and the region’s leader, Eduard Kokoity, discussed South Ossetia’s future earlier this week in Moscow, South Ossetian parliamentary speaker Znaur Gassiyev said. Russia will absorb South Ossetia “in several years” or earlier, a position that was “firmly stated by both leaders,” Gassiyev said. A Kremlin spokeswoman said she had no such information and declined immediate comment. Moscow has recognized South Ossetia and Abkhazia, a second separatist region of Georgia, as independent, drawing criticism from the West. Russia found itself unable to shore up its own international support when China and four former Soviet republics in Central Asia refused a Moscow appeal to recognize the territories. The Associated Press: South Ossetia: Russia intends to absorb region. This will be fun. It’s goin to be a *Really* Cold War if they can’t take a frickin’ joke. MOSCOW (Reuters) – Prosecutors in Russia want to ban the award-winning satirical U.S. cartoon South Park, calling the series “extremist” after receiving viewer complaints, a spokeswoman said on Monday. South Park, a cartoon aimed at adults and featuring a group of nine-year olds in a Colorado ski town, has courted controversy from its 1997 debut, parodying celebrities, politicians, religion, gay marriage and Saddam Hussein. “Our complaint is against a lot of cartoons, but this one was from South Park season three, episode 15,” he said. The episode, called “Mr. Hankey’s Christmas Classics” on the cartoon’s website http://www.southparkstudios.com, first aired in December, 1999, and features the cast singing Christmas carols. “It’s one thing if they are on cable TV and viewers pay money and make a conscious choice. But young children should not be able to turn on the TV after school and watch this. They need to be defended,” Bendas said. Russia passed a 2006 law widening the definition of extremism to include “the abasement of national dignity” and “inciting religious and national hatred,” which backers say was needed to stem a wave of violence aimed at ethnic minorities. You would figure that Russia’s version of the Patriot Act would put ours to shame. This is an interview with Wesley Clark regarding the recent happenings regarding Russia and Georgia. Two things to notice here….what an absolute pathetic hack Cavuto is(1) and what a generally smart and strategic thinker Wes Clark is (to no one’s surprise). I’ll bold Cavuto’s propagandic statements and insane bias. The fact that Fox News isn’t news isn’t news, so don’t focus too much on that. In Clark’s statements I’ll highlight the substance of the interview…if you want to actually know more about the situation and read some good strategy for dealing with it, read that part. UPDATE 10/21/08: I have made a video version of this argument. It can be seen here. I found it hotlinked on Fark, but the original is here. BEIJING, China (CNN) — Sharpshooters from Russia and Georgia embraced Sunday after earning medals for their countries, which have been teetering on the brink of war since the Beijing Summer Olympics kicked off last week. Russia’s Natalia Paderina and Georgia’s Nino Salukvadze hugged after winning Olympic silver and bronze medals, respectively, in the women’s 10-meter air pistol competition. The rivals kissed each other on the cheek after standing on the medal podium with China’s Guo Wenjun, who won the gold medal in the event. Waving flower bouquets high, the women smiled broadly at the audience. “If the world were to draw any lessons from what I did, there would never be any wars,” Salukvadze, 39, said afterward, according to media reports. The reports described the two as friends. This is good to see…if a bit ironic. I mean…sharpshooters? !